Pet Proof Carpet Pad . . . Really? There are few things more exciting than new carpet! If you’re in the market and you have pets, be sure to expect to hear all about pet proof carpet pad. Keep in mind that you’re purchasing more than just carpet, you’re also investing in carpet pad. Carpet pad is a layer of dense foam that sits between your carpet and your sub-floor. Just like carpet, you’ll have many choices ranging in quality and price. The sales staff will likely offer you the latest and greatest in carpet pad. Just do your homework to make sure you’re getting what you need. Moisture proof or pet proof carpet pad has been on the market for several years. This carpet pad is specifically designed to repel moisture, most commonly in the form of pet urine. You can expect pet proof carpet pad to be more expensive than regular carpet padding. Here’s what you should know. Pet proof carpet pad DOES NOT stop your pet from having accidents on the carpet. When carpet is exposed to pet urine, the liquid has to go somewhere. Pet proof carpet pad does not make urine magically disappear or stop your pet from having accidents. When the pet proof carpet pad is installed correctly, the urine stays on top of the padding and doesn’t soak into the pad. What the urine does do is move across the top of the pad and the back of the carpet. The urine ends up saturating the back of the carpet rather than the pet proof carpet pad. This can result in a larger area of carpet being exposed to urine damage, but it also keep the urine out of the carpet pad. Pet proof carpet pad can make urine removal easier for your carpet cleaner because the urine has not saturated into the pad. However, it may be more widespread on the backing of your carpet. Urine on the back of your carpet can cause delamination, which means the carpet begins to separate from it’s backing. Basically, whatever is spilled on your carpet will remain on your carpet and spread out since it doesn’t have the option of being absorbed into the pad. 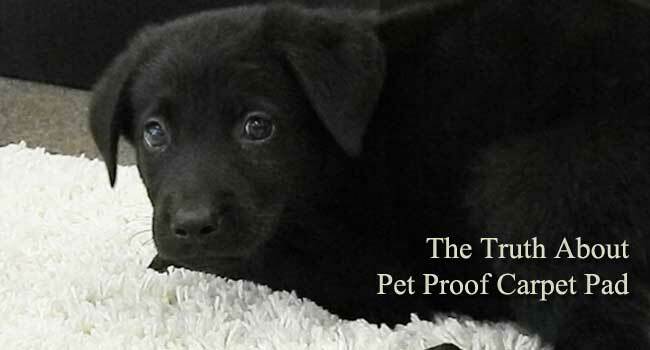 A word of caution, don’t be fooled by the words “pet proof”. Pet proof carpet pad REPELS moisture. When installed correctly, it will definitely keep moisture and urine from soaking into your carpet pad. But remember any urine or liquid that is spilled on your carpet will go somewhere; either into your carpet pad or be absorbed by the carpet backing. You have to decide what’s best for your home.